As a homebuyer, when purchasing a home, you are responsible for paying the downpayment AND closing cost fees. Closing cost are fees associated with the the purchase of a home outside of the mortgage, and range between 2% and 7% of the price of a home. Closing costs include but are not limited to Application fees, Homeowners Insurance, Inspections, Loan Origination, Private Mortgage Insurance (PMI), survey, recording fees , Property Taxes, title insurance, etc. The good news is that a buyer can negotiate with a seller to have the seller pay the closing cost; however, there are limitations. Each loan type has slightly different rules when it comes to seller contributions. Fannie Mae and Freddie Mac are the two rule makers for conventional loans. They set maximum seller paid closing costs that are different from other loan types such as FHA and VA.
Here’s a chart describing maximum seller paid costs for conventional loans. While seller paid cost amounts are capped, the limits are very generous. For all FHA loans, the seller and other interested parties can contribute up to 6% of the sales price or toward closing costs, prepaid expenses, discount points, and other closing costs. If the appraised home value is less than the purchase price, the seller may contribute 6% of the value. The seller may contribute up to 4% of the sale price, plus reasonable and customary loan costs on VA home loans. Total contributions may exceed 4% because standard closing costs do not count toward the total. Payoff of the buyer’s judgments and debts. For instance, a buyer’s core closing costs for things like appraisal, loan origination and title equal 2% of the purchase price. The seller agrees to prepay taxes, insurance, the VA funding fee, and a credit card balance equal to 3% of the sales price. This 5% contribution would be allowed because 2% is going toward bona fide loan closing costs. USDA loan guidelines state that the seller may contribute up to 6% of the sales price toward the buyer’s reasonable closing costs. Anyone who might benefit from the sale of the home is considered an interested party, and their contribution to the buyer is limited. Can the Seller Contribute More than Actual Closing Costs? No. The seller’s maximum contribution is the lesser of the sales price percentage determined by the loan type or the actual closing costs. For instance, a home buyer has $5,000 in closing costs and the maximum seller contribution amount is $10,000. The maximum the seller can contribute is $5,000 even though the limits are higher. Seller contributions may not be used to help the buyer with the down payment, to reduce the borrower’s loan principal, or otherwise be kicked back to the buyer above the actual closing cost amount. While seller contributions are limited to actual closing costs, you can constructively increase your closing costs to use up all available funds. 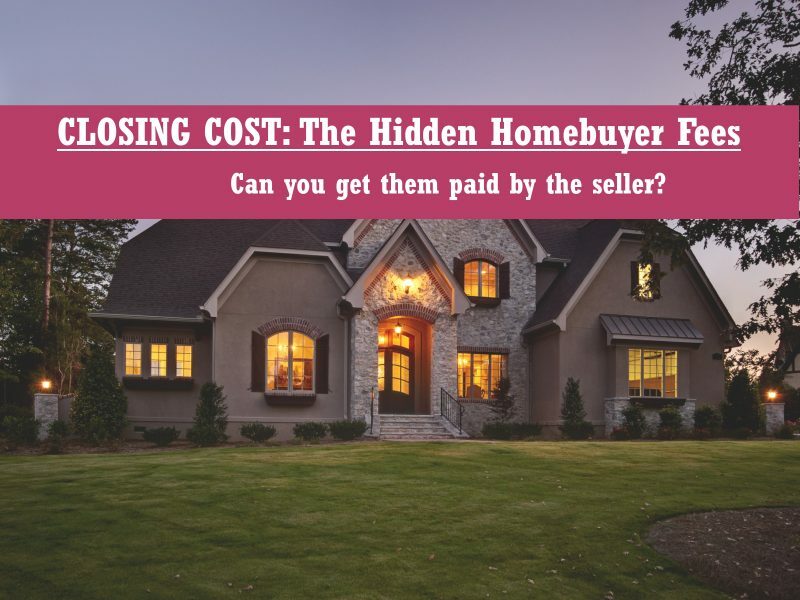 Imagine the seller is willing to contribute $7,000, but your closing costs are only $5,000. A whopping $2,000 is on the line. Use it or lose it. In this situation, ask your lender to quote you specific costs to lower the rate. You could end up shaving 0.125%-0.25% off your rate using the excess seller contribution. You can also use seller credits to prepay your homeowners insurance, taxes and sometimes even HOA dues. Ask your lender and escrow agent if there are any sewer capacity charges or other transfer taxes or fees that you could pay for in advance. Chances are there is a great way to use all the money available to you. You can even use seller credit to pay upfront funding fees for government loan types like FHA. All government-backed loan types allow you to prepay funding fees with seller contributions. FHA. FHA loans require an upfront mortgage insurance payment equal to 1.75% of the loan amount. The seller may pay this fee. However, the entire fee must be paid by the seller. If you excess seller credit, but not enough to cover the entire upfront fee, you cannot use the funds toward the fee. VA. The seller can pay all or part of upfront fee of 2.15% – 3.3% of the loan amount. The fee counts towards VA’s 4% maximum contribution rule. USDA requires an upfront guarantee fee of 2.0% of the loan amount. The buyer can use seller contributions to pay for it. A seller credit can remove the closing cost barrier and help buyers get into homes for little or nothing out-of-pocket. When buying a home it is always worth consulting with a trusted Realtor. At Executive Sellers Realty, we want to help you with the purchase of your home. Give us a call (7044912870) at anytime and we can meet for a free consultation appointment.